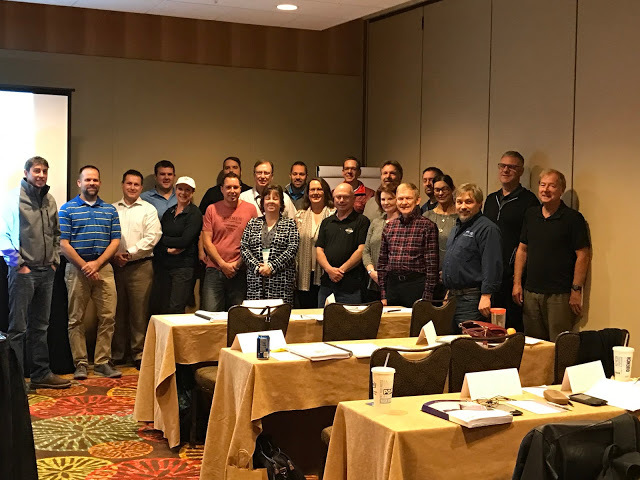 The two-day Universal Design/Build class, as an adjunct to the Certified Aging In Place Specialist designation program, kicked off today at the Hyatt Regency Hotel in Orlando as part of the Pre-Show Education at IBS. Steve Hoffacker, CAPS, CEAC, SHSS, taught the class. This class does not carry any standalone designation credentials by itself, but it represents 12-hours of continuing education for qualifying professionals, including those with other professional certifications and those seeking NAHB building and remodeling designations, such as CGR, CGB, GMR, and GMB. For some attendees, this is the final class they need for attaining those advanced designations. People representing homebuilding, land development, remodeling and renovation, custom building, design-build, interior design, architecture, accounting, product design, occupational therapy, kitchen and bath design, and other disciplines assembled from around North America, with one from New Zealand also. Michigan, West Virginia, Pennsylvania, New York, Nebraska, Iowa, Washington, California, Colorado, Texas, Florida, Maryland, and Ontario representation gave the group a coast-to-coast perspective. Collectively, the group represents a substantial and impressive number of years of experience. Many of the participants already have their CAPS designations, and several of them have other prominent designations such as AIA, ASID, CKD, and advanced NAHB building and remodeling certifications. Even those without their aging in place certification have a personal interest in designing safe spaces and in promoting comfortable living environments. Nearly everyone who takes any of the aging in place or universal design courses has a direct connection to the topic through family members or close friends. All of the attendees will take what they are learning and put it into practice in their individual marketplaces with their clients in designing safe, comfortable, and accessible new and existing homes. The focus of universal design is not on working with any particular age group, type of housing, or disability but on general livability for anyone – including renters. The universal design class evaluates the entire home and looks for ways to offer it in an optimal way – beginning at the street and continuing all the way throughout the home and each of its room and what they contain. Systems, components, best practices, guidelines, recommended procedures, and building codes are discussed and taken into consideration for accomplishing effective designs. How people currently use their homes, how they need to use them, their lifestyle requirements, and how those homes are presently equipped are important assessment criteria that are used in evaluating and formulating a universal design treatment strategy. Priorities also are set to undertake the most pressing work, those that have been budgeted, those where a safety issue is present, and those specifically requested by the client. In addition, it’s often possible to partner with other funding sources or entities to bring about essential changes in people’s homes. The other nice aspect of universal design treatments is that they are undertaken to be functional and effective while being essentially invisible as to calling attention to themselves or looking like anything special has been done in a home other than making it safer and more comfortable. Pictured below is today’s class.